MOA inhibiting activity. The phyto-substances responsible for this include quericitin, pseudohypericin and xanthones. Taken as a whole plant extract these substances do not pose the usual MAO inhibiting risk. TCA –like activity. In 1997 further studies revealed that Hypericum appeared also to act on the levels of norepinephrine and dopamine giving it tricyclic antidepressant characteristics. SSRI- like activity may be attributed to the phtyo-chemical hypericin, xanthones and flavanoid amentoflavone.Sedative effects may be attributed to hyperin, biflavone and the amino acid gamma-amino butyric acid. Some active ingredients act on levels of dopamine levels in the brain. Responsible for movement and feelings of pleasure. Other active ingredients have a calming effect. 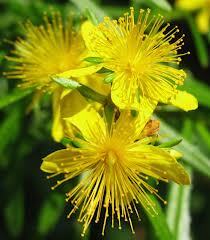 St John’s Wort has demonstrated antiviral activity. May be regarded as a long-term treatment for depression improving a sense of contentment. Raised seratonin levels may assist in cases of insomnia improving sleep patterns and quality. May be used to stimulate the immune system and liver to eliminate toxins from system. May help in treating compulsive eating disorder, assisting in weight loss. It is not fully understood how Hypericum treats depression but researchers are getting closer to some conclusive answers. It is not recommended that Major Depressive Disorders, Dysthymic Disorders, Bipolar Disorders and Cyclothymic Disorders be treated with St John’s without professional advice. In addition to this there is still insufficient conclusive research findings on St Johns Wort efficacy is treating these serious biochemical illnesses. St John’s Wort may be used long term as part of a training regime for horses. Helpful in addressing separation anxiety in horses. May be used for territorial behaviour in pets. Compulsive obsessive behaviour in dogs. Helpful in treating cats that urinate or spray indoors. For excessively nervous animals finding it hard to adjust to new surroundings. Do not exceed the dose without consultation with a practitioner familiar with herbal products. Do not use in conjunction with other medication. St John’s Wort must not be Taken in combination with allopathic antidepressants, HRT or the contraceptive pill until the current research on its possible effect as a liver flush on allopathic medicines has been fully completed.